Fall has finally arrived in the Bay Area and, while I appreciate the season-appropriate weather, a part of me is finding it very hard to adjust to the colder temperatures (and the fact that it’s pitch black at 5:30 p.m. now. I mean, seriously?). The good news is that this is the perfect time to snuggle up and enjoy hearty, warm soups and stews. 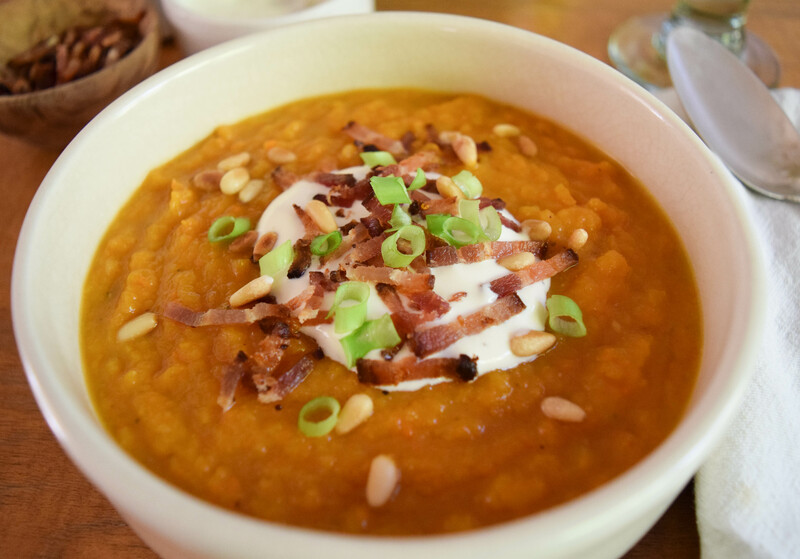 This butternut squash soup is one of my favorites, because you can roast the squash and even cook the bacon in advance, making it a pretty simple and relatively quick dinner that is guaranteed to give you that cozy, fuzzy feeling, also known as warm-soup-belly. It also freezes really well, so you can make a big batch once and enjoy it all winter long. You can serve it on it’s own as a main course, combine it with a salad for a quick lunch, or serve small portions as an appetizer. And you can mix and match different toppings to suit your taste. For the rustic version in the recipe below, I like to add sour cream to make it creamy and add a bit of a sour note, crispy bacon for texture and saltiness, something fresh, like scallions, fresh herbs, or micro-greens, and something crunchy, like pine nuts or croutons. If you want to make a vegan version, simply leave out the sour cream and bacon, and substitute the butter for vegetable oil. For a more elegant version, top it with a little drizzle of good olive oil, a dash of sherry vinegar (for that hint of sour), and fresh Italian parsley. 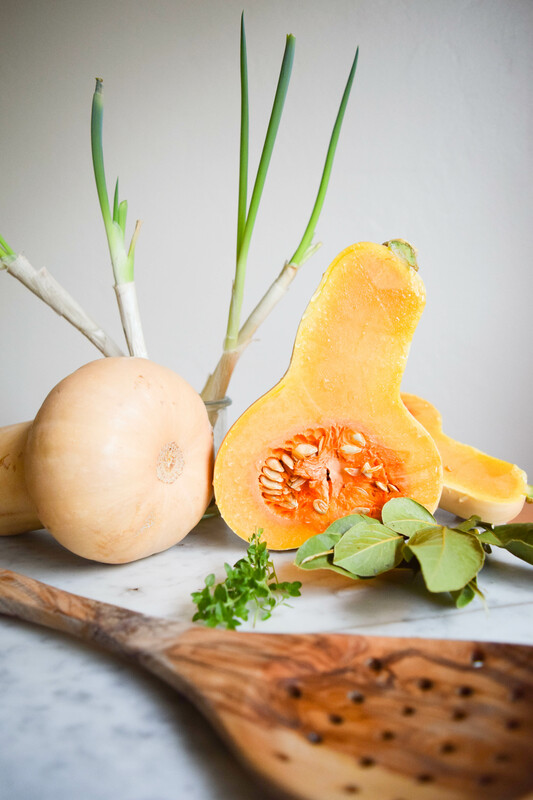 Since butternut squash contains a lot of starch, there is no need to add any thickening agents. Roasting it in the oven before turning it into a soup not only intensifies flavor, but also converts some of the starch into sugar, making it even more delicious. Using a sturdy knife, carefully cut the butternut squash in half. Scoop the seeds out with a spoon and, with the cut side up, place the two halves on a baking sheet lined with parchment paper. Rub them with olive oil, add a couple of twigs of fresh thyme, and sprinkle with salt and pepper. Roast at 350°F until the squash is completely tender and the edges are browned nicely, about 40 minutes to 1 hour. In the meantime, roast the pine nuts in a dry non-stick pan. Set aside to cool. Fry the bacon strips until they are really crispy. Transfer them to a plate lined with paper towels to absorb any excess grease. Once they have cooled completely, cut them into small strips or cubes. 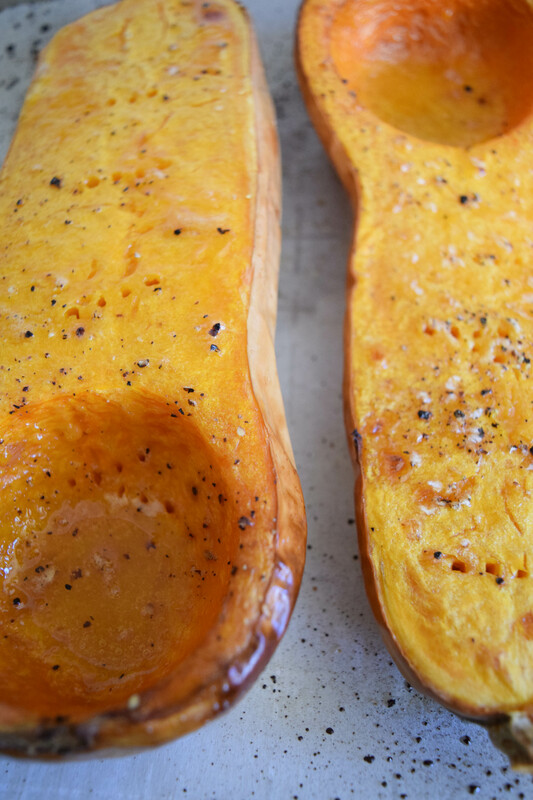 When the squash is done roasting, set it aside to cool, then scoop out the flesh with a spoon. In a large pot, melt the butter and cook the onion until golden and slightly translucent. Add the minced garlic and continue cooking until fragrant. Add the butternut squash and vegetable stock and bring to a simmer. Take the pot of the heat. Using an immersion blender, puree the squash until it has the desired consistency (I like mine a little bit chunky). If you like your soup really smooth, transfer it to a food processor (working in batches) and blend it until it has reached the desired consistency (be careful not to fill it too high and to loosen the plug in the access opening to allow the expanding steam to escape), then strain it through a fine mesh strainer into a pot and reheat it. If the soup is a little too thick for your taste, add a bit more stock or water. Add salt, black pepper, and cayenne pepper to taste. Stir the sour cream to make sure it is smooth, add salt and pepper to taste. Chop the scallions. 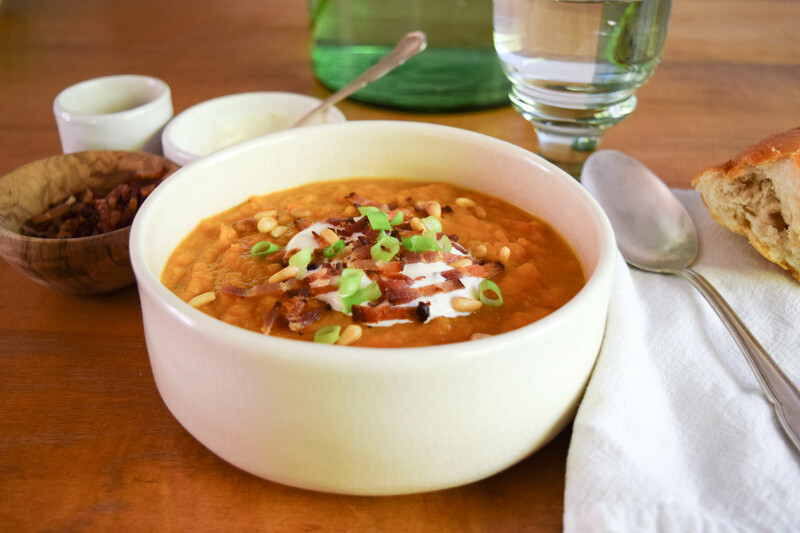 Top each portion with a dollop of sour cream and sprinkle with bacon bits, roasted pine nuts and scallions. Serve with baguette or other fresh bread. pine nutsPreheat the oven to 350°F. Using a sturdy knife, carefully cut the butternut squash in half. Scoop the seeds out with a spoon and, with the cut side up, place the two halves on a baking sheet lined with parchment paper. Rub them with olive oil, add a couple of twigs of fresh thyme, and sprinkle with salt and pepper. Cut squash in half, scoop out seeds with a spoon. Place squash halves on baking sheet lined with parchment paper, cut sides up. Rub with olive oil, add fresh thyme, and sprinkle with salt and pepper. Roast at 350°F until completely tender, about 40 minutes to 1 hour. Roast pine nuts in dry non-stick pan. Set aside to cool. Fry bacon strips until crispy. Transfer to a plate lined with paper towels to absorb excess grease. Once cooled completely, cut into small strips or cubes. Scoop out squash flesh with a spoon. In a large saucepan, melt butter and cook onion until golden and slightly translucent. Add garlic and continue cooking until fragrant. Add squash and vegetable stock and bring to a simmer. Puree with immersion blender or in food processor. If the soup is too thick, add more stock or water. 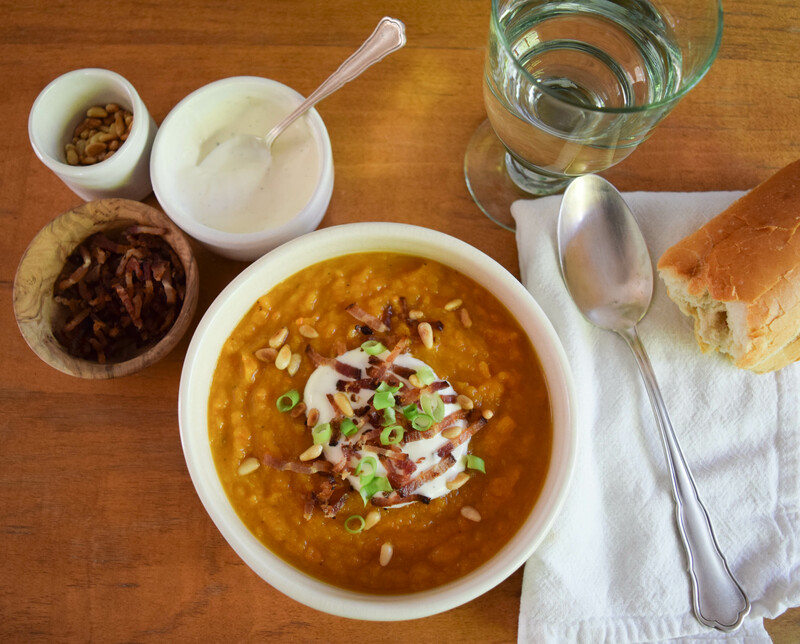 Serve with sour cream, scallions, bacon, pine nuts, and fresh bread. Tip: If you have leftovers, freeze small portions (1-2 cups) in zipper lock type freezer bags (just the soup without any of the toppings). Be sure to remove as much air from the bag as possible before closing it. Freeze flat so they won’t take up a lot of space and will thaw very quickly. This looks amazing, wonderful photos and nice steps! I am Lynn. please visit me if you have time, I would love to follow your blog! Thanks, Lynn! It’s lovely to meet other food bloggers. This soup looks so creamy and delicious! I love squash. Oh my goodness, I will most certainly be making this over Thanksgiving! It looks incredible as always. You can also pan fry the squash seeds with a bit of olive oil – you’ll know they’re done when they start to pop. It’s worth a try, trust me! That sounds amazing, I will definitely give it a try! Thanks, Jess.